I’ve made it clear before how much I admired Roger Ebert, the esteemed film critic who passed away after a lengthy battle with cancer around 18 months ago. He had a knack of writing extremely insightful reviews that were well worth reading even when his opinion was completely at odds with mine, and when I try to write reviews, his writing is the benchmark that I aspire too. 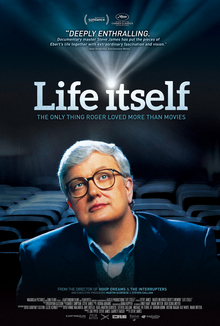 ‘Life Itself‘ was filmed shortly before his death, and features a combination of footage of him in his final months, as well as talking head style interviews and clips from his television work, particularly with the late Gene Siskel. The documentary recaps the main events from Roger’s life, with a particular focus on his career as a film critic, the career that had made him famous across the globe with movie lovers everywhere, as well as his struggles battling thyroid cancer which had taken so much away from him in his later years. The best sequences focus on his love/hate relationship with his fellow TV host, Gene Siskel, who also lost his life to cancer. I was too young (and not American) to watch ‘At The Movies‘ (and it’s other guises) when it was on air, but the footage paints an interesting picture of the antagonistic relationship between these two men who were both supremely passionate about movies. The film also spends time with a couple of filmmakers who got their break through the passionate support from Ebert (and Siskel), including the director of this documentary, Steve James (Ebert championed his debut documentary ‘Hoop Dreams‘ in the early 90’s), which showed his passion for film went far beyond the populist thumbs up style of TV review shows. This was a man who cared about movies with every fibre of his being. Most of all, ‘Life Itself‘ is an enjoyable biopic of Roger Ebert’s life, funny, moving and captures the kind of person he was both as a professional and as a family man. Him, and his writing, are badly missed.